Wartime Mission: Trainer Aircraft. 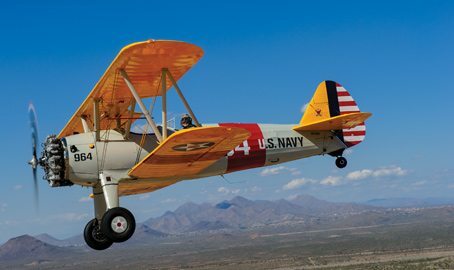 The Boeing Model 75 US Navy N2S-3 Stearman bi-plane (Navy variant of PT-17 and also referred to as “Kaydet”) served as a military trainer in the 1930s and 1940s for the USAAF (USAF), US Navy, and the Royal Canadian Air Force. A total of 8,584 were built in the United States and is one of the most recognized trainers of all time. The majority of pilots learned to fly in a Kaydet and were required to solo in this aircraft before receiving pilot wings. Crop dusting, aerobatics, wing walking and various sport uses. It has also been in the movies seen chasing Cary Grant across a field in North by Northwest and was featured in The Aviator. Accessibility: Must be able to climb into cockpit; maximum passenger weight not to exceed 290 lbs. Passengers must be 12 years of age or older. Minors who fly (age 12-17) must have their guardian complete a Minor Hold Harmless agreement and the guardian(s) must be present on the day of flight. Maximum passenger weight 290 lbs. For your safety and ours, Passengers must be able to enter and exit the aircraft without assistance. Passengers that cannot board without assistance will not be flown. Passengers may be required to demonstrate that they can board and exit the aircraft prior to boarding. Please see the video for more information.